vision statement Wynberg Girls’ High School is a value-based, eco and socially conscious learning environment encouraging the development of confident and unique women who strive for excellence. values INTEGRITY | Integriteit | Isidima We conduct ourselves in all areas of our lives with honesty, honour and trustworthiness. INCLUSIVITY Inklusiwiteit | Ukuzibandakanya We accept and include people who are different from us and make an effort to create a school in which all feel that they belong. COURAGE | Moed | Inkuthazo We strive to do the right thing and, through innovation and a pioneering spirit, challenge our boundaries and never give up. ACCOUNTABILITY ToerekenbaarheiD Ukuthath’uxanduvA We are responsible citizens and remain true to our commitments in all spheres of our lives. RESPECT | Respek | IntloniphO We value ourselves and other people by recognising their rights and dignity. We value the environment. We take responsibility for our behaviour. EMPATHY | Empatie | Uvelwano We try to put ourselves in the shoes of others, to understand people, and respond with compassion, kindness and consideration. One of the reasons I love working on the annual school magazine is that it allows me an opportunity to delve into the activities and events of our school over the past year. It is an exercise that always leaves me a little surprised (“It really happened THIS year?”), very much in awe of the amazing people that make up our school family, and extremely grateful to be doing the job I love right here at WGHS. Life is often compared to a roller coaster ride, but that amusement park activity just seems a bit too predictable to truly reflect this journey we are on. In January 2018 we had no idea that polony was going to try and kill us, the Parkland USA shooting would happen, Zuma would step down as president, Black Panther would become a Marvel hit, we would lose people like Stephen Hawking, Winnie Madikizela-Mandela, Avicii, Aretha Franklin and Stan Lee, Day Zero would silently disappear, or that the #TimesUp and #MeToo movements would envelop the globe. Maybe life is more like a mountain bike race: a little scary, somewhat unpredictable, with treacherous twists and turns that, when navigated successfully, reward you with breathtaking views and an exhilarating sense of achievement. Scrapes and bruises heal. The camaraderie and memories are lasting. The young women of Wynberg Girls’ High completed the 2018 race in a way that shows how they have embraced our newly-introduced values. Unapologetically crusading for a healthier planet, our school is now proudly plastic shopping bag and balloon free. The Q&A (Queers and Allies) Society was introduced in the third term, simultaneously creating another safe space and raising awareness. There were extraordinary triumphs in sport, culture and academics, both individually and together. Both integrity and commitment were shown by all those who might not be the best in their field, but made us proud by doing their personal best. Excellent standards were maintained in our core business, academics, with the girls achieving remarkable results in all their internal and external exams. The Wynberg Girls’ High community makes our world a better, happier, more understanding, more aware, more ‘woke’ place. Enjoy your stroll (or scroll) down the 2018 memory lane. Re-live our race with us. A year in the life of a school, especially one which is 134 years old, can be seen as insignificant in the full history of the school. However, for those involved in the school in 2018, it was filled with events in all the pillars, successes on many fronts and important changes to the way things are done at school. Wynberg Girls’ High School has committed itself to a journey of transformation and, after hours of discussion, the new school values were introduced. High on that list is the value of inclusivity and we worked hard to ensure that all Wynberg girls feel that they have a safe space at the school. The LGBTQIA+ Society started, and the FemSoc and Current Affairs societies debated topics to help us better understand important issues. Our value of courage, embodied in our badge with the lion, encouraged the school and learners to take steps in this journey, sometimes needing to change traditional thinking and replace it with that of the world of the modern young adult. Integrity, accountability, respect and empathy – the other school values were also highlighted and embraced and this led to a greater sisterhood being developed between the learners. Staff members also grappled with difficult topics in staff development sessions so that we, too, could further develop empathy to understand the lives, cultures and differences of the diverse learners who are part of this wonderful South African school. 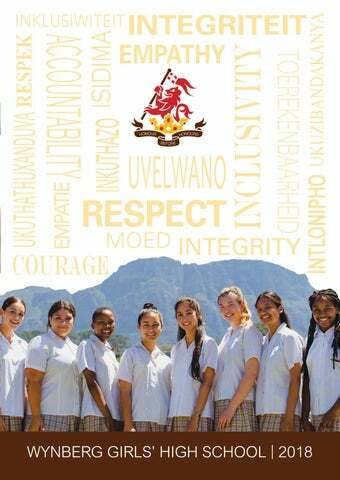 This magazine highlights the many activities of the outstanding young women of Wynberg. The exceptional level of success depends on a committed staff, and learners who set their goals high in the activities of the four foundation pillars of the school – Academic, Culture, Service and Sport. Thank you to everyone – teachers; admin and support staff; parents, guardians and caregivers; and, most importantly, the Wynberg girls. In our history, 2018 will never be “just another year” – it was a great Wynberg year celebrating what we stand for and who we are! 2018 flew past! It has been a busy year for the school and all its role players. The year started with the Governing Body Elections, with the whole governing body being re-elected for a new 3-year stint. It was gratifying to see so many parents make themselves available for election, keen to be part of the school’s governance. Similarly, staff, both teaching and non-teaching, also stepped up to be part of the Governing Body team, committing to 3 years of involvement, on top of their already busy schedules in their day-to-day school lives. The third arm of the governing body is the learner representation, and again, thank you to our learners for getting involved, staying late at school for meetings and helping us with their input in our decision making. The school is an extremely busy place as evidenced by this annual magazine, each page a testament to the work done by the girls and the staff across all four of our pillars. Their achievements add to Wynberg Girls’ High School’s reputation and keep it a school of choice for parents and girls. After 5 years of life in the school, with exposure to not just academic life, but also strong encouragement to get involved in the Service, Cultural and Sport pillars, a Wynberg girl should be able to leave the school, ready to tackle her next steps. It has been a great pleasure to be a part of the school’s life during the past year. We have worked closely as a team of governors, and it is a pity that we lose Hilary Mills, the non-educator staff member who has been on the governing body for many years as our very valuable secretary. Thank you for your hard work, and good luck in your new ventures. Good luck, also, to the matrics of 2018. All the very best for the next phase of your lives. 2018 has been a busy year for the committee of the Wynberg Old Girls’ Union. As always we had a super response from our past pupils to so willingly give of their time and assist on our committee. To the wonderful women of worth – Ann Coltham (Vice Chairperson), Hilary Mills (Treasurer and invaluable school liaison), Tracy Mills (Secretary and official sponsorship collector), Saarah Holmes (nee Coenraad) and Andrea das Neves who returned to serve this year, Tracy Stallard, Rona le Roux, Bev Edwards, Ruth Chalmers, Sandy Smith, Carole Fallows, Mignonne Schafer and Amy Wilkinson, also a new member with a strong school connection – a very special thank you! We meet, we laugh, discuss and plan, and we achieve our goals. This year we decided to treat both the matrics about to write their June exams as well as the Grade 7s embarking on their steps into the big world of High School. The girls were presented with fabulous goody bags at special assemblies. Careers Connect proved very motivational as we had past pupils from various disciplines meeting up with Grades 10 and 11 to discuss their interests in career choices for the future! Mentorship is one of the key aims of our Union. We also ran a most inspiring self defence workshop for past pupils. This will be repeated as it is an essential skill we all need to have. Our social responsibility program, Wool for Wonders, continued very successfully over the winter months. Well done girls of Wynberg and all the grannies, moms and past pupils who once again ensured that many little children and babies were warmly clad for the chill! The annual Founders’ Day week was the perfect place to catch up on past friends, colleagues and educators. We also had the first get-together of Wynberg Old Boys and Girls at Stellenbosch campus. We look forward to meeting new members and many more involved alumnae. a special occasion for Mrs Shirley Harding to wish past pupil (Matric class of 1936) - Elizabeth (Nesta) Theron, nee Delport (left), a happy birthday on behalf of the Old Girl’s Union as she celebrated her 100th birthday! Members of the class of 1988 celebrate 30 years since they matriculated. Leila Emdon Leila Emdon arrived to do her 5 week stint as a student teacher, and ended up staying for the rest of the year as an intern in the History and English Departments. She led both her classroom and FemSoc with her unique and quirky style. Leila has kept our stomachs full with her amazing baking skills as well as our minds with her incredible compassion for social justice issues. Paige Du Plessis Paige Du Plessis started at WGHS in 2003. During her time at Wynberg she has been involved in teaching many subjects such as Creative Arts (Art) and Consumer Studies. She became a stalwart in both the Technology and Life Orientation Departments. Her students loved the passion she brought to her teaching. She was involved in many other aspects of school and was part of the athletics team and netball management. Here she always made sure to keep the girls in high spirits on and off the court and track. She also served as the Assistant Pillar Head for Service and headed up the Occasions Team. Sadly we said goodbye to Mrs Du Plessis at the start of this year as she chose to pursue her interests outside of teaching. She has been missed by all who knew her for her bubbly, fun-loving personality. Jackie Morton (Kunze) After several years teaching in the U.K, Jackie Morton has spent the past 13 years teaching English at Wynberg Girlsâ&#x20AC;&#x2122; High School. A new marriage, relocation and a burgeoning family life are taking her away from us. Whether in the classroom, as head of GET English, running the debating society or on the tennis court encouraging a love for the game among the social tennis students, Jackie has carried herself with grace and good humour. Her students have appreciated the care and creativity that go into her lessons and her colleagues have appreciated her efficiency, competency and warmth. Wynberg wishes Jackie all the best for her new life. We hope it will prove exciting and fulfilling. Suretha Van Bergen joined the music department firstly as a part time vocal teacher and then in a full time capacity. An experienced and committed teacher, she has always approached her teaching with the greatest sense of professionalism. She has a kind, gentle and caring temperament. She has always been willing to go the extra mile, giving selflessly of her time to our school in order for her pupils to excel. During her time at Wynberg she has taught aural, theory and history of music, individual voice and piano lessons, vocal ensemble and choir. Under her baton the choir and vocal ensemble have won numerous awards at the Cape Town and Afrikaans Eisteddfods, as have her voice students, many of whom have gone on to study music at the Universities of Cape Town or Stellenbosch and have become accomplished performers, touring South Africa and abroad. Her vocal ensembles have also been winners at the All Girlsâ&#x20AC;&#x2122; Festival on numerous occasions, including 2018. Our music department has been truly blessed to have someone with her passion for music, her exceptional teaching skills,and her inimitable knowledge of her subject from which many have benefited over the years. It is with great sadness that we bid farewell to such a wonderful teacher, friend and colleague. She will be sorely missed. We wish her well in her future endeavours. Bridget Patel Bridget Patel joined the English and Life Orientation departments in 2008 and has been an integral member of both departments ever since, teaching Grades 8 through to 12 over the years. An experienced and enthusiastic teacher, she has always approached her lessons and her numerous other responsibilities with passion and professionalism, with her classes enjoying a comfortable and enjoyable classroom environment. During her time at Wynberg, Ms Patel was a Constantia tutor and more recently head of Grade 12, a job which she embraced with great fervour. It is most likely though through her development of the Wynberg Careers Evening into the major annual event that it is now where she most leaves her mark. It is with great sadness that we bid farewell to such a wonderful teacher, friend and colleague but we wish her well for this new season of her life. Nathan Lewis It has been a pleasure to teach with Nathan Lewis. He was a tower of strength and knowledge. We thank him for his support, guidance and encouragement that he diligently provided to his students. We wish him well in his future singing career and hope to see him on stage when we visit Artscape. staff Janice Hudson-Windsor As a fun-loving past pupil, Janice Hudson-Windsor returned to her Alma Mater to take up the position of Head of Sport at the beginning of 2013. Never one to do anything in a half-hearted manner, she stepped in and put her own stamp on sport at WGHS. Although not a strict disciplinarian, her requirement of learners to do the right thing led to commitment, a team mentality and lots of fun. A particular passion was that learners looked good in their sports uniform, and many earned demerits for this offence! Success is not always immediate but sticking to the plan was something which endeared her to coaches and teachers. Not one to panic because of a setback, she would offer encouragement and coaching to remedy the game plan and, in her tenure at Wynberg, we saw many young women achieve provincial status and some who went on to represent South Africa, particularly in Ms HudsonWindsor’s favourite sport, hockey. Janice has a wonderful sense of humour which was enjoyed by staff members. She is unfailingly honest and was willing to challenge traditions when necessary. An absolute team-player, she was a wonderful member of the school management team and would always offer to give time and help to others. A positive approach to life, integrity, respect for others, initiative, problem-solver and reliability are words which easily describe her. Janice and her wife, Mandy, (and the dogs) moved to Scotland in July 2018 where Janice is coaching hockey and hoping to travel and enjoy new places. We wish them well in their new life and trust that Ms Hudson-Windsor will visit Wynberg again with a Scottish touring team. However, we suspect she will have divided loyalties as she will always be a “Wynberg” girl! Sarah Ferguson-Brown Sarah Ferguson-Brown epitomized the term ‘Dynamite comes in small packages’. She began her teaching career in 2012 at Wynberg Girls’ in the Maths department. Her passion for Art moved her toward the Creative Arts and Visual Arts department. She motivated for the purchase of a printing press in 2015 and initiated the Printing Club, allowing girls to experiment with a variety of printing methods. Lino and collagraphs have been incorporated into the Creative Arts programme and many girls have subsequently used printing as their medium of choice for their Grade 12 Art PATS, allowing WGHS to showcase a variety of visual arts skills in their final exhibition. As a special surprise, she created beautiful invitations for the Matric Dance of 2016. Sarah headed the Grade 9 team and was an enthusiastic Wellesley House co-ordinator. Life is full of unexpected surprises and opportunities: whilst on holiday in Vietnam, she was approached and accepted an offer to head up an Art Department at a private school in the country. We miss her dynamic approach to teaching, problem solving, and her bubbly and compassionate personality. We have a beautiful, original Sarah Ferguson-Brown etching of a Protea hanging in the school to remind us of her time and contribution to WGHS. Thank you and bon voyage Sarah. Lindsay Wills Nazeeba Moerat Nazeeba Moerat arrived at WGHS in 2007 to take up a position in the Maths department. However, it was not long before she moved to the Physical Sciences department where she taught Grades 10-12 for more than 10 years. Nazeeba resigned at the end of 2018 from her permanent position but she will be doing some parttime teaching here in 2019 and so we will still benefit from all her experience in the subject. Nazeeba will always be remembered as a dedicated teacher who set high standards for the students she taught and who has helped launch many girls on their Science careers! Anya O’Hagan Anya O’Hagan joined the staff as the Marketing Manager in January 2016. She brought to the position a creative flair and new ideas, and was an important part of the school team in the design of the new website. New opportunities and possible further study in her other passion, Psychology, saw her leave us in March 2018. We wish her well in the future. Lindsay Wills left Wynberg at the end of the first term in 2018 to pursue other forms of online tuition and teacher training with the goal of beginning studies for her doctorate at some time in the future. She did return in the third term to teach our Grade 10s and 11s. Lindsay threw herself wholeheartedly into whatever she tackled. Employed primarily as a Grade 8-12 History teacher, she also taught English and significantly involved herself in the cultural pillar. Dynamic, transformative, passionate and inspirational, she was entirely committed to the education of young women. She brought enormous intelligence, a searching questioning and an integrity that inspired. She took a sabbatical in 2016, when she was awarded a scholarship to complete a Masters degree in Gender Studies at York University (for which she obtained a distinction). She was an exceptional scholar and a role-model of lifelong learning. Apart from her significant contribution to the classroom, her introduction of FemSoc in the Cultural Pillar has had an extraordinarily valuable impact on the school. This society particularly has informed much of the practice of our value of inclusivity in the school. She challenged oppressive binary gender constructs and paved the way for the inclusion of those left out of mainstream narrative - especially those without the social or cultural capital to demand some space. She brought the same commitment and creative energy to the Major Productions that she was involved in. Working alongside Keenan Oliphant as assistant director in Thoroughly Modern Millie and then as director of The Crucible, she revealed an ability to be an outstanding team player and a leader. We will follow her career path with interest, and will always value the immense contribution she made to our school. Halfway through the year, and halfway through the hockey season, we bade farewell to Ms Janice Hudson-Windsor (Ms Winds to the girls), when she left our shores on her Scottish adventure with Mandy and the fur-children. Janice was our Head of Sport, Head of Hockey and one of the first team coaches for a number of years. And in WP circles, she embodied WP School Girls’ Hockey. She brought humour – and a little craziness – into every situation. This was a ‘tot weersiens’ or ‘till we meet again’ to a mentor, a friend and an inspiration. The first of the farewell events was our last fixture with Ms Winds in charge - fittingly against Rustenburg Girls’ High, whose first team is coached by Andi Bernstein, Janice’s coach when she was a WGHS pupil, and a dear friend. All the Wynberg players and coaches wore yellow ribbons with #thisonesforyou. Ryan Pillay said it beautifully: “When you play for something and in this case, someone, the result becomes irrelevant. The heart takes over, and the team unites for a set or planned outcome. Today, that was all for you.” The first team clash was the final match of the day. It was a hard-fought battle of wonderful hockey, with a team desperate to win their last match with Ms Winds. The outcome was not certain until the last moment, and when the final whistle sealed a Wynberg victory there was no holding back the emotions. It was a time for celebration, heartache, tears, love, and for enormous pride. What better way to end off than to sing the school song? Hundreds of people conspired to keep the last farewell event a surprise for Ms Winds. Believing there was a touring team from Johannesburg we were playing that afternoon, it was really a tournament with teams made up of current and past Wynberg players and coaches. The final game was an exhibition match with two teams of WGHS First Team, Western Province and Protea players, all connected to Wynberg Girls’ High, in a fabulous display of excellent hockey and great camaraderie. A potluck dinner gave the hockey families the opportunity to say goodbye to the HudsonWindsors. problems. We used our motto for 2018, “Spirit, Unity and Pride,” and our new set of Wynberg Values to ground us and inspire us to take risks, make mistakes and be drivers of change. This year has allowed us to grow and gain so many different experiences and skills that will definitely influence us in the new journey we are about to take. I always said leadership was never merely about wearing the badge. It is more about the impact that you have on the people following you and upholding the motto “Honour Before Honours”. The end of 2018 really gave me the opportunity to reflect on the year and see all the changes that have taken place within the school. I believe our biggest achievement was creating a more positive atmosphere at school. The aim of the Student Council was to make all our events as much fun as possible in the hope of lessening the stress that school work usually causes. We wanted Wynberg Girls to believe as strongly in our motto as we did, and at the end of the year we were rewarded with the laughter, smiles and the support that these girls showed each other. I want to thank all the learners, leaders and staff for making this year so phenomenal. It would not have been such a success without everyone’s input and support! Lastly, I wish the Student Leaders of 2019 ‘Good Luck’ for their year in office. I hope that you can build on this year’s legacy and continue the process of change and growth at Wynberg Girls’ High School. very leaders who will cause ripples of change in their journey forth. There were many “surface” changes that the RCL successfully initiated through the suggestions route, but a deeper message we aimed to promote was not necessarily a change that was physically tangible. This was a message of female empowerment. It was a message directed to every single woman making a change and wanting to be advocates for social justice and wanting to make a meaningful difference in our lives within and outside our school walls. One area where that fight was evident was in the change the RCL had undergone in the few years I had been honoured to serve my grade and then, this school. The RCL I walked into vs the RCL I will be leaving brings me a great sense of pride. The transition from a shopping list council with materialistic wants and demands into the more thoughtful, insightful and transformation-inducing suggestions that we now receive is owed to the girls making a concerted effort for change – those wanting to right the wrongs of the society they see themselves being brought up in. Continue to be the independent and strong advocates for change that I have known you to be. Through this, all of you who have been part of the system that has tried to make WGHS a better place for everyone – a place where everyone feels they have a voice- we honour and recognise your efforts. We need to continue to march forward as women before us have done, as individuals in a broader and much bigger female community. And the change should continue here, in our very own school. We had two Prize Giving events: the Grade 8 & 9 ceremony in the morning, and the Grade 10 & 11 in the evening. On both occasions, the hall was filled with excitement and pride as educators and parents celebrated the achievements of our learners in 2018. Our guest speaker in the morning was Illse Davids â&#x20AC;&#x201C; a past pupil of Wynberg, who achieved great things at school, in her field of study and as an Olympic sportswoman. She commented that many of the lessons needed for her success could be traced back to the opportunities offered and taken at Wynberg. In the evening, our guest speaker was past pupil Rehana Odendaal. Rehana, from a very young age, has been committed to social justice and making South Africa a better space for all. She talked about the importance of celebrating the achievements of young women, reminding us of how very important it is not only to do so when an award or certificate is given, but for the many achievements along the way - when significant courage was needed just to pick oneself up. After two very inspiring and successful ceremonies, it is hoped that our learners will find in the words spoken, and the experiences lived, clear points from which to chart their course. The Valedictory ceremony celebrates a culmination of twelve years of schooling, a recognition of development and success, and a final farewell to what has for many become more than a school, but a home. The Informal Valedictory Service was a joyous event. A delightfully entertaining video, created by the Memories Committee, tracked the WGHS journey of the Class of 2018. The Grade 11s sang Hall of Fame as a tribute to the matrics, the Staff members chose Firework with its affirming lyrics as their send-off, before the matric group ended the assembly with an emotional rendition of Wherever I go by Miley Cyrus. The Valedictory Service and Prize Giving was an inspirational affair - from the extraordinary speech of our Guest of Honour, Zimkhitha Peter, through the acknowledgement of the fantastic achievements of our matrics, to the touching performances by Isabelle Hayes on the saxophone and the choir. Mrs Harding addressed the assembly before Aqilah Regal, 2018 Head of School, addressed the Class of 2018 for a final time. CLOCKWISE FROM RIGHT: Mrs Shirley Harding with guest speaker Zimkhitha Peter; Okwethu Banisi; Yumna Ederies and her parents; Singing the School Song for the final time. ACADEMIC PILLAR 2018 In one of the very first speeches I made in assembly, I spoke about time and the importance of making the most of every single second because we have so little of it. I made this speech at the beginning of my term as the Head of the Academic Pillar in Term 4 of 2017. I believe the Academic Committee and I have made the most of the time we had. Now my time as the head of this pillar has run out and it is time to say goodbye. Academics is a vital and important part of our school careers. In the words of the late Nelson Rolihlahla Mandela: “Education is the most powerful weapon which you can use to change the world.” When I entered the position as the Head of the Academic Pillar, the Grade 12s were starting their preliminary examinations and would later complete their final examinations. Both of these exams are extremely important in the school career of a Grade 12 learner because how well she fares decides whether she stays in this chapter of her life or ventures into the next. Just to let them know that we were thinking of them, the Committee and I decided to give the matriculants good luck cards to wish them the very best. Term 4 is a stressful term for all of the learners. The Grade 8s write their first final high school exams. The Grade 9s use these exams to see if what they chose as their subjects for Grade 10 is what they really want to do. The Grade 10s write their first final exams for the subjects they chose and the Grade 11s use these results to apply to universities and colleges. In order to alleviate the stress, the Committee decided to put up a ‘Meme of the Week’ and a ‘Fact of the Week’ on our noticeboards. We also put up how many days there were left until exams started and until the end of the term. We set up a Google Drive folder for past papers that any learner could access. After the stress of exams, we had a Pillar Day where all the pillars offered an activity for the learners to do. The Academic Pillar decided to do something fun and we hosted a puzzle barter where each team had a puzzle to complete; however, they had to barter with the other teams in order to get their puzzle pieces. Term 1 of 2018 was definitely the busiest term for the pillar. With a new year comes a new set of fresh-faced Grade 8 learners. The Academic Pillar was allocated a slot during orientation and we decided to give a presentation describing the Academic Pillar and academic life at Wynberg Girls’ High School. We then played something similar to Trivial Pursuit with the Grade 8s. The learners had to guess what movie a quote was from, who the celebrities were and what the flags, logos and landmarks were. They also had to answer questions relating to world news. In February, we held the annual Athena Games with Wynberg Boys’ High School. Learners, who had to enter in pairs, had to dress up as duos, such as Batman and Robin or a cheeseburger and fries. Groups participated in various subject-based games held by the Academic Committees of both schools. The night was a success and everyone enjoyed themselves. Something the Academic Pillar cannot miss is Pi Day, which takes place in March. The Grade 12s celebrated the day by taking a photo whilst sitting in the shape of the Pi symbol in the Honours Quad. The committee also held a Pi recital competition for the learners and teachers in order to see who could recite the most digits of Pi from memory. It was amazing to see how many digits the learners and teachers could actually recite. Something to mention from Term 2 was the video we made that was played before the June exams. In the video we gave the learners some tips on how to survive exams at Wynberg Girls’ High School. I am honoured to have led the Academic Pillar. It has been an amazing experience and learning opportunity. There are so many people to thank for the amazing success the Academic Pillar has had. Some of these people include the Academic Committee and the teachers in charge. I trust that the success of the pillar has made previous Wynberg girls proud and I have no doubt that future leaders will continue to do the same. The WGHS Class of 2018 achieved outstanding results, and we are extremely proud of them! All 173 candidates passed, giving us a 100% pass rate. Arguably even more important is the fact that 168 of them qualify to attend university with a Bachelors Pass, while the remaining 5 are all able to enter other tertiary education institutions with their Diploma Passes. Wynberg Girls’ High School was announced as the top state school out of 65 schools in the Metro South Education District. The top three candidates at Wynberg in 2018 were Na-eela Coleman (93.6%), Juliet Killick (92.1%), and Aneesa Rawat (88.7%). These 3 young women were part of a group of 12 who obtained 7 distinctions each, with just under a quarter of our candidates achieving 4 or more distinctions. Eight girls are in the Top Twenty learners from state schools in the Metro South District: Na-eela Coleman, Juliet Killick, Aneesa Rawat, Jessica Austin, Isabelle Hayes, Saarah Abrahams, Abby Anderton and Malikah Gaibi. The subject results were equally impressive, with 387 individual distinctions obtained. Half of our 16 subjects achieved an average above 70%. Dance Studies (88%), History (86%) and Visual Arts (86%) obtained subject averages over 80%. Kayla Morgan, Ishwarya Ramklass, Juliet Killick and Lara Johnson all received 100% for History! Congratulations to every one of the matrics of 2018. We salute you and your phenomenal achievements. We wish you well for the future, and look forward to hearing about all the great things we know you will accomplish. WGHS is privileged to offer Cambridge AS LEVELS courses in both English and History in the Grade 11 year. In October/November, 20 of our Grade 11’s wrote the external examinations in English Language and Literature and 21 wrote the History exams. We are very proud of the Wynberg girls who took on this challenge. Their hard work has paid off as all of our candidates passed the exams. Particular congratulations go to the following who achieved distinctions: Kaley Appleton and Joanna Roodt (Distinctions in both English and History) Nicola van Tellingen (Distinction in History) Amina Castineira, Jasmine Kennedy and Mu’minah Salie (Distinction in English). academic pillar AFRICAN DANCE WORKSHOP Indigenous Cross-cultural dance is part of the Dance Studies Curriculum, and this year we invited Elvis Sibeko to do a workshop with our Dance Studies girls. Elvis is an internationally acclaimed teacher of African Indigenous crosscultural dance forms such as gumboot dancing, pantsula and the more traditional dances such as the Zulu warrior dance, Umzanzi. AFRIKAANS FIRST ADDITIONAL LANGUAGE ATKV SPELATHON Six of our learners received certificates for entering the Afrikaans Home Language ATKV Spelathon. This competition is held in grade groups: Grades 8 and 9, and then Grades 10 - 12. AFRIKAANS EISTEDDFOD On the 14 May, inspired by Ms Marais, 4 learners went to Herschel High School and participated in the Kaapse Afrikaans Eisteddfod - one of the oldest Afrikaans eisteddfods in South Africa. Nawaal Jacobs and Kayla Steenkamp entered the poetry section for which they received Honourable Mention and Praise respectively, while Amy Tasten entered the prose section and received a Highest Praise certificate for her work. MATRIC ART EXHIBITION Our matric art students displayed their yearâ&#x20AC;&#x2122;s work at the annual Matric Art Exhibition in October. The evening was officially opened by Liesl Hartmann, Head of the Education Programme at Zeitz Mocaa. The themes of Baggage/ Burdens were interpreted in a multitude of different ways, showing the imagination and creativity of our learners. ATHENA GAMES The Athena Games, organised by the academic committees of Wynberg Boys’ and Girls’ High, had 22 participating teams putting their minds to the test while having fun with games and challenges. There was something for everyone, not just the “academically inclined.” Games ranged from Pictionary, to Biology in 30 Seconds, and even a dance-off. This year, our Bridge Building team designed a truss-arch bridge in the 5 hours they were given. Their bridge was proudly painted in the school colours, and was able to withstand 60kg. This effort placed them ninth out of 36 schools, and top amongst the all-girls’ schools. CAREER connect The Careers Connect evening, organised by WOGU, has become a wonderful opportunity for the Wynberg girls to find out more about careers our past pupils have gone into over the years. This year, speakers at the event ranged from Photographers and Youtubers to Anthropologists and Marine Biologists. CONSUMERS STUDIES The Consumers Studies girls are consistently encouraged to create Masterchef-quality dishes. In order to get top marks these learners have to master a variety of skills pertaining to many different cuisines and genres. Our Dance Studies Matrics performed their final Dance Practical in August. DISCOVERY WEEK Introduced with the aim of allowing Grade 8 learners to develop 21st Century skills, Discovery Week once again pushed the girls to display the 9 core objectives: Collaboration, Creativity, Critical Thinking, Communication, Functional Digital Skills, Curating Information, Cultural and Social Understanding, Learning Independence, and E-Safety. ENGLISH: A VISIT BY EDYTH BULBRING It was a rare treat for the Grade 10s and their English teachers to engage in a delightfully witty, entertaining and inter-active discussion with Edyth Bulbring, author of the literary work, The Mark. Prof Amanda Esterhuysen, renowned archaeologist and Associate Professor at Wits University, presented a talk on Contested Histories: Excavating the site of the Siege of Mugombane. WGHS hosted the event and History teachers from all around Cape Town attended. The Grade 10 History learners played Mancala, arguably the oldest board game in the world. There is evidence of the game being played in Africa and Asia for thousands of years. Introducing the topic of Southern Africaâ&#x20AC;&#x2122;s Long Past, the Grade 10 History girls were challenged to see which group could build a puzzle of Africa in the shortest time - testing their knowledge of the continent we live on. HEART DISSECTIONS The practical components of the Life Sciences syllabus are always much anticipated. The Grade 10 learners learnt about the heart through dissections, and did blood pressure tests on each other. MGENAFRICA GENOMICS The field of genomics was introduced to learners from all over Cape Town by the University of Cape Town (UCT) in a workshop in August. Sponsored by the pan-African bioinformatics network H3ABioNet Consortium, the day included quizzes, Q&A sessions with UCT researchers, a career corner and online competitions. PHYSICAL SCIENCES EXPERIMENT THE ICE CREAM LAB The Ice Cream Lab visited WGHS to demonstrate their use of liquid nitrogen to make ice cream to the Grade 11 Physical Sciences classes. The girl were able to taste two of their many extravagant flavours: Vanilla and Nutella. Not only were they fed delicious ice cream, but they were also able to play around with liquid nitrogen. MUSIC - MARIMBAS In 2018, the Music Department introduced Marimbas as an instrument of choice in the academic syllabus. Grade 8 subject music pupils took part in a concert at Springfield Convent School. The peer tutors provide curriculum-related assistance to learners from all grades: whether someone is struggling after missing school, or battling with a tricky concept, these girls are always willing to help. Pi DAY In celebration of Pi day on 14 March, the Academic Committee hosted the Pi recital challenge. Contestants had to recite as many digits of Pi that they could remember, with only seven seconds hesitation allowed in between the citing of any number. Ms Kim could recite a grand total of 73 digits, and Aashiqah Regal was able to recite a whopping total of 120 digits of Pi! ROYAL SOCIETY SCIENCE ESSAY COMPETITION Three of our learners won prizes in the 2018 Royal Society of South Africa National School Science Essay Competition. In the category ‘Cutting edge of gene editing’, Aneesa Rawat won a 2nd prize of R4 000 and Isabelle Hayes won a merit prize of R1 000. In the category ‘Water is the new gold’, Juliet Killick won a merit prize of R1 000. SAIIA (SA INSTITUTE FOR INTERNATIONAL AFFAIRS) Natasha Mtila, Nonelela Madubedube, Mu’minah Salie and Nicola van Tellingen participated in a quiz relating to international politics, economics and philanthropy in an eventful evening in which much was learnt. OUTINGS AFRIKAANS Fifteen learners attended the Woordfees in Stellenbosch where two theatrical productions were on the cards for them: “Cry our beloved country” (a combination of Afrikaans and some English poems) and “Liewe Heksie en die sirkus”. The Grade 10 Geography girls went on an outing around Cape Town which allowed them to explore our city’s geomorphology, comparing rock types, and examining the effects of erosion. The Grade 11s visited the Koeberg Nuclear Power Station on their excursion, where they were treated to a presentation on exactly how nuclear energy works. HISTORY Our first outing for the year was to two exhibits: Deadly Medicine at the CTHC, and Derek Bauer’s political cartoons at the SA Museum. The Grade 9 classes visited District Six on their outing, which focused on providing a deeper understanding of the long-term causes of Apartheid and how this led up to the displacement of the people of District 6. The objective for the Grade 10 History girls on their outing to the Slave Lodge and Prestwich Memorial was to learn more about part of South Africa’s very dark history - the slaves and marginalised people who helped build this city. Robben Island was once again the destination for the Matric History excursion. The girls went on a tour around the island before being guided around the prison complex by an ex-political prisoner, who was willing to share many personal stories of his time on the island. The Grade 9 and 10 Art students went to Stellenbosch for an outing which included a visit to the Stellenbosch University Museum and the Rupert Museum. They learnt about artists such as Christo Coetzee and Willie Bester. It was a rare treat to see the Rupert collection of paintings by Irma Stern and J.H Pierneef, and a special exhibitation of Walter Battiss art. There was another excursion to the South African Museum. NATURAL SCIENCES The Grade 9s enjoyed a morning at Intaka Island, Century City observing the natural habitat of the bird life in the Wetland. The Grade 12 Physical Sciences students got to see and experience Science in action through the many interactive exhibits, puzzles and astronautical paraphernalia on display at the Cape Town Science Centre. their black and gold to support the Jazz Band. The Jazz Band’s performance was incredible and the amount of support that they received led to their winning the Spirit Award for the 4th time. The Cultural Pillar is full of stars, but we have to make special mention of a few girls who have done exceptionally well this year. Kristina Burge (Grade 11) was given the lead role of Tracy in the wellknown musical “Hairspray” which will be performed at Artscape next year, Micaela Arries (Grade 10) was chosen as one of 8 violinists to perform at the Nelson Mandela Centenary Celebrations and Phoebe Andrews (Grade 9) performed with the South African Youth Choir at the State of the Nation Address in February. In August, Jenna Koopman (Grade 10), Zoë Koeries (Grade 9) and Tara Roos (Grade 8) danced at the Edinburgh Fringe Festival in Scotland, and Juliette Lindup (Grade 10) and Kayla Anderson (Grade 10) took part in the New Prague Dance Festival where their dance school came 3rd overall for Classical ballet. All in all, this has been an extremely exciting and eventful year for the Cultural Pillar, and we thank the teachers and the students for the huge amount of work, passion and dedication that they put into the Cultural Pillar of 2017/2018. Olivia Joseph, Zahra Gamiet, Savanna Boughwan Middle Row: Aimée Cawood, Geenah Philander, Jade Carlos, Mia du Plessis, Imogen Cupido, Megan Rutherford Front Row: Azrah van der Schyff, Joey Gordon, Mrs Debby Saporetti, Tanyaradzwa Ngandu, Ashna Ramjee This past year has been an eventful and exciting one for the art committee. We were honored to have well known artist, Hasan Essop, as a guest speaker. Throughout the year termly art exhibitions were set up to showcase the students’ artistic talents. In term three we worked hard to frame and set up artworks depicting powerful women in honour of Women’s Month. Towards the end of the year the art committee helped the matrics frame their work and set up the matric exhibition. We have worked hard to promote art, educate the general public about the art that is in their community, and create a support system for the artists in our school through the termly exhibitions, keeping the art room clean and having guest speakers talk to students to inspire and educate. Drama The WGHS Drama Department put on the funny, endearing, thought-provoking, dreadfully sad and profoundly moving production of Caryl Churchill’s “Love and Understanding”. Ms Penelope Glover did an outstanding job in her direction of this play. She and her cast vividly revealed a fast-paced world that is at once connected and disconnected, virtual and immediate. The anxieties of our age and the fragmentation of our lives were powerfully communicated. The major production, and our annual collaboration with WBHS, was “Shrek the Musical”, directed by Ms Krystle Kustanovich. From a land far, far away, came a story almost as old as time itself, brought to the stage by the talented thespians of Wynberg Boys’ & Girls’ High Schools. A comedy-musical with a live band, actors, singers, dancers, and crew all drawn from the scholars of our two schools, it starred Kristina Burge as Fiona. It started with Shrek as a baby, Donkey providing the laughs (as always), and Lord Farquaad scheming his way to the throne until Princess Fiona took her true form. The show was truly intriguing, funny, and very, very magical. Clockwise from top: The cast of Shrek, The Musical; Ocean, Hannah and Mia as the Duloc Dolls; Palesa, Hluma, Engracia and Corina as the Pied Piper’s Rats; Ivanka, Hluma and Ashleigh as the Three Blind Mice; Kristina Burge as Princess Fiona. Through vignettes portraying the reality of life, the cast of Love and Information explored the theme of love in a world where we are bombarded by information. BOTTOM RIGHT: The cast of Love and Information. Alexandra Kandralides, Jenna Koopman Middle Row: Zoë Koeries, Robyn Adams, Aster Horne, Chelsea van der Ross, Kya Adriaan, Mia Paulsen Front Row: Melissa Hull, Jesse Vosloo, Tsholofelo Mangadi, Mrs Jackie Badenhorst, Jamie Hull, Kezra Cairns, Nabeelah Jacobs Dance Society is for people who share a love of dance, and want to showcase it. The dancers range from trained dancers, to freestylers, to anyone who wants to just dance. This year’s Dance Showcase, “This is Me!”, directed by Mrs Jackie Badenhorst, was vibrant, slick, varied and highly entertaining. It was an event that left audiences regretting that the run of the show was not a little longer. Performers came from all of the dance groups in the school: our Dance Studies girls, those who are members of DanceSport and the Dance Society. The cast of This is Me! Our Dance Sport girls had another superb season in the second year of the Dance Sport School League. A number of our dancers were selected to represent Western Province at the Inter-Provincial Tournament held in KwaZulu Natal, with Celeste Ficks, Gita Urion, Ashleigh Turner, Amber Abrahams, Jamie Fisher and Adrianne Fisher earning their National Colours! Dance Sport was also introduced to the masses with a highly entertaining House Challenge at the end of the year. MUSIC MUSIC DEPARTMENT The last few years have seen the WGHS music department grow from strength to strength. 2018 has seen our flute, vocal, jazz and marimba ensembles, choir and combined Boys’ and Girls’ High concert band performing at various eisteddfods and competitions in and around Cape Town with success. Our pupils have also achieved excellent results in the external music exams. Amber Abrahams, Amisha Dhaya, Bella Draper and Kezra Cairns achieved over 80% in their Grade 6 external exams. Micaela Arries and Hannah Müller passed their Grade 8 violin exams with merit. The combined Jazz Bands, Concert Bands, String Ensembles, Wind Bands and Orchestras of the four Campus Schools performed at the annual Ensemble Concert in August. The conductors were drawn from all four schools, and teachers joined their students in what was a marvellous making of music. The third annual Marimba Jam Festival this year was the largest one yet. Over three hundred marimba players congregated at the Hugo Lambrechts Music Center to entertain a crowd of four hundred - a sold out festival. On Thursday, 9 August (Women’s Day), over 250 girls of all ages gathered together in Tygervalley Mall to break a World Record. Organised by Marimba Jam, the aim was to break the record for the biggest marimba ensemble, a record previously set by an Australian group with 180 people. Marimba Jam decided to break the record with only women in honour of Women’s Day and because Marimba Jam was established solely by women. A number of our Wynberg Marimba Bands performed extremely well at the Marimba Jam Eisteddfod. Wynberg bands did exceptionally well with most bands achieving distinctions. The Rumblebees, a Grade Ten band, achieved 84%, and the Senior Grade Eleven band achieved 86% in the senior section. Dynamics, a junior band, achieved an outstanding 95% for their performance, making them one of the top performing bands in their age category. Ms Kiara Ramklass came to the school to award the “Winning School” Trophy which the school won. CLOCKWISE FROM ABOVE: The Marimba Jam Festival; Ms Kiara Ramklass and some of the members of our Marimba bands with the ‘Winning School’ trophy; Relaxing before another performance. It is generally a week to ten days before the Matric Music students are due to play their Music Practical Examinations that a concert is held for parents, staff and friends. This year the programme included a single performance of one of the pieces from their repertoire on which they would be examined at the end of the year. A rich and varied programme of pianists, guitarists, flautists and vocalists from the classics to the contemporary entertained the audience. Adding to this special night, we were very lucky to have Mrs Wendy Ackerman in the audience. Mrs Ackerman, one of our Alumnae, was responsible for the donation of our new grand piano, as well as a financial donation enabling us to transform what was formerly an art room into a small concert venue. It was an honour to have her there and we are very grateful for her contribution to the music department. The Sunset Concert, featuring the Combined Concert Band, took place at the John Baxter Outdoor Theatre at WBHS. They performed five pieces of varying genres, before being joined by the Boys’ Junior School to play a further 4 pieces. It was a thoroughly enjoyable evening to send off the matrics. cultural pillar Ubuntu Society The Ubuntu Society is a cultural society that is made up of five subgroups: choir, umxhentso, umjaivo, poetry and hip-hop. Between March and September this year, cultural evenings were hosted at various schools. By participating in these cultural evenings, we were able to establish connections with Ubuntu Societies at other schools. The theme for our society this year was IMBEWU (the seed) and it signifies our growth throughout the year as a society. Our own cultural evening was a great success. The Marimba band welcomed our guests, the foyer and hall were tastefully bedecked with cultural decorations, and the students from different schools were dressed in their ethnic best, all setting the mood for the evening. Special guests such as the Sinezandi violinist group were invited to perform alongside our own Ubuntu Society and various groups from other schools, ensuring that our evening was memorable. We cannot end this summary without mentioning the commendable effort and meticulous planning of Ms Ntombekaya Didiza, Mrs Kerry Hermans and the Ubuntu Gr 11s. In celebration of International Cultural Diversity Day, an assembly was led by Culture X where we enjoyed a number of performances, including Ubuntu and the Hindu Dancers. We reflected on who we are, the impulses which shape us and draw us towards leading a more fulfilling intellectual, emotional, moral and spiritual life. CAPSTONE The Christian Union girls went on a combined CU camp with Rustenburg, Rondebosch and Wynberg Boys’ High at the Rocklands campsite. Across the four schools, over 128 students attended the event. It was a weekend filled with exciting worship sessions, passionate speakers and loads of team spirit and games. The theme of the camp was “Warrior” and was particularly focused on the armour of God and being a warrior for God. We were blessed to have phenomenal speakers from Jubilee Church (Daryn, Tom, Ryan and Steve) who made their sessions captivating and relatable so that people could understand and grasp the importance of dressing ourselves in the armour of God. BRIDGE CLUB Four of our girls played in the Western Cape Bridge Union’s Schools Open Day Bridge Tournament at Western Province Cricket Club. Ashleigh Mingo and Andrea de Kock held onto the top spot for 2018. They received acknowledgement for the skill with which they played. While one normally needs a 60% winning streak to place, the pair won 76% of their games. MOOT COURT Nicola van Tellingen (left) and Jasmine Kennedy (right) took part in the National Moot Court competition. Our girls made it through to the quarter-finals and were placed 10th in the country - the best Wynberg has done in the eight years since the competition was founded! Wynberg was also the highest ranking team from the Western Cape. MUSLIM STUDENTS’ ASSOCIATION (MSA) On Tuesday, 22 May 2018, Wynberg Girls’ High School’s Muslim Students’ Association hosted their annual Iftaar in the Aileen Currie Hall. The event was attended by many and featured an extensive programme, which consisted of a guest speaker, Zakkiyah Sablay, and spoken word poet, Kaamilah Cornelius. The special guests for the evening were the children from Beitun Nur, a home that is based in Schaapkraal as well as the children from Darun Naim, which is located in Wynberg. The children were given gifts which were generously provided by the MSA and other Muslim students from Wynberg Girls’ High. The evening was a great success and was one of the biggest annual dinners hosted thus far. Photography SOCIETY Photography at Wynberg has become an integral part of the way we showcase our school and the talent of our girls. This year at the Cape Town Eisteddfod, several of our girls won prizes for their photography. In our weekly lessons, we experimented with various different types of photography, ranging from food photography, nature photography to even having practical lessons in class. Our photography committee this year also organized an Online Exhibition, showing off all our girls’ work from Grade 8 to Grade 12. This was a first for our society. Members of the Photography Society were invited to a photography workshop hosted by Orms. Five of our senior photography members spent the morning learning all about studio photography, dark room photography and cinematography. The professionals at Orms were most welcoming, and created a very friendly learning environment. Service Pillar 2018 It has been a great honour to watch the service pillar expand and grow through yet another year of hard work by all of the Wynberg women. Each and every service pillar club and society has given back so much to both the school and community, through their drives, fundraisers and day to day acts of kindness. The school really came together this year to contribute to several drives such as the Winter Warmth drive in which, through collaboration with Rotary, the Wynberg girls donated many bags of clothing towards The Rainbow Dream Trust in Hout Bay, the Owl project bottle drive which gave Wynberg families a sustainable solution to the vast number of plastic water bottles collecting within their homes, the PlumPets pet food drive and last but not least the library book drive and fundraiser which was aimed at contributing funds and books towards education within St. George’s Home for girls. Through the annual ‘Wool for Wonders’ campaign, all of our girls were able to give back by knitting hundreds of warm woolly clothing items for children within our extended community. Many girls also took part in the Haven Night Shelter civvies day and the Blind Buddy awareness day. The annual Rock of Ages concert proved to be a great success with girls from both the service and cultural pillar coming together to put on a concert for the elderly members of our community. Our school has made a concerted effort to give back to the environment through the ‘Rethink the Bag’ campaign, the banning of balloons and the overall vast reduction in water usage. Mandela Day this year also had an environmental focus as girls took part in a 67 minute litter clean-up at the Black River. Community service within houses was taken to even greater heights this year with weekly visits to children’s homes and hospitals, several beach cleanups and so much more. The sandwich drive has proven to be as successful as ever with girls bringing in hundreds of sandwiches each week. All in all, it has been a wonderful year to be part of the service pillar and, as the outgoing service representatives, we have great belief that the work done by all present and future Wynberg girls will continue to make us and the surrounding community proud. Our Academic Outreach girls tutor about 50 girls from Langa’s Zimasa Community School on a weekly basis. This partnership has been in place for the past 9 years. Our school provides the transportation to allow the Zimasa girls to attend their English and Mathematics lessons every week. COMMUNITY SERVICE BY HOUSES All of our Houses participate in community service projects throughout the year. Some of these projects for 2018 included Apsley’s partnership with Read to Rise, Cavanagh’s visits to Maitland Children’s Hospital, Constantia’s soup kitchen and Kirsten’s shelter clean-up. Every Thursday morning all the houses make sandwiches for the learners of Capricorn Primary. Our Enviro Club was presented with numerous challenges and opportunities in 2017/18. With one of the worst droughts experienced in decades, the saving of water, and valuing it as one of the precious resources it is, became an incredible learning opportunity. Sustainability and eliminating the plastic shopping bags and balloons from our school (a campaign driven by Sarah Lee) were significant shifts achieved. The Cape Town Environmental Education trust works to support the preservation of Cape Town’s unique and biodiverse natural heritage through education, training and conservation initiatives. Their small grants facility supports and drives conservation initiatives in Cape Town. They have been supportive of our Enviro Club’s partnering with Capricorn Primary in Vrygrond to create a sustainable vegetable and fynbos garden, as well as to introduce eco-bricking into the school. Wynberg contributed to the treevolution as our Enviro Club handed over five filled boxes of eco bricks to the Greenpop Nursery in Woodstock. Having started this initiative in mid-2017, the Enviro Club has actively encouraged the involvement of the school in filling two litre bottles with non-biodegradable waste, transforming the school into “garbage warriors”. As a result of these efforts almost 300 eco bricks were delivered, which will be used in future construction projects at regional schools. The pinnacle of our year was when Wynberg Girls’ High School was awarded our Silver Eco-School Award from the Wildlife and Environment Society of South Africa. WESSA is an organisation of ‘People Caring for the Earth’ and is a national leader in, and supporter of, environmental education. To win the award the Enviro Club submitted a portfolio outlining all the eco-projects the school has been running this year and conducting an audit to show how we have developed in our ecoconsciousness since last year. This year our projects included the school’s epic water saving journey, the Grade 9 recycled plastic jewellery project, the Natural Science Department’s Term Three paperless experiment and all the Enviro Club led projects; Rethink the bag (see overleaf), paper recycling and the Fynbos and vegetable gardens. RETHINK THE BAG One of the major environmental projects in 2018 was to make Wynberg Girlsâ&#x20AC;&#x2122; High School a plastic shopping bag free zone. Embracing the principle of being advocates for change as a plastic shopping bag free school, we are encouraged to eliminate plastic shopping bags not only from our premises, but to encourage our studentsâ&#x20AC;&#x2122; families and the broader community to elect to use multi-use shopping bags as well. One of the ways that we could do this, was to give some of the bags that we designed to another school in Cape Town. Members of the Enviro Club thought it an ideal opportunity to be champions of that change by giving reusable bags to all of the Matrics at Intsebenziswano High School. A note wishing them luck for their final exams was also attached. A number of Wynberg girls were involved in the Dancers Love Dogs show performed at the Artscape Opera House on 25 October. This is an annual show in which dancers collaborate for mass sterilisation of animals in need. The cost of a seat pays for the sterilisation of one dog. Tehya du Toit, Lara Marais, Kiara Bassett, Kayla Anderson, Melissa Hull and Kaitlyn Wilson from different studios participated in the show. FEMSOC Alexandra Kausch facilitated and led discussions about body positivity, boundaries and the importance of knowing our bodies. All of the three workshops, whose topics were a FemSoc and Peer Guide collaboration, were well attended by students and teachers. In one of our initiatives for the year our Interact Club volunteered at the Adaptive Surfing Day held by Surf Emporium. This is a wonderfully rewarding experience which allows volunteers to assist as part of a team facilitating surfing lessons for individuals with disabilities. Another Interact event was the annual Sisanda Funday held in conjunction with the Sisanda Foundation. The vision of the Foundation is to create a world in which all children can experience the joy of being children and have the chance to laugh, run, jump and play. Volunteers from both WGHS and WBHS Interact societies contributed to this programme by organising an event for Grade 3 Capricorn Learners. quidditch In honour of World Book Week, the sports pillar hosted Wynberg’s very first Quidditch tournament. Girls were allowed to sign-up for their favourite Hogwarts house: Slytherin, Gryffindor, Hufflepuff or Ravenclaw. Most of the participants were die-hard Harry Potter fans which created the fun-intense atmosphere on the day. The teams dressed up in the colours of their Hogwarts houses. 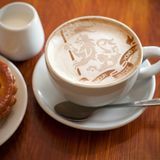 Gryffindor played the strongest game, as they made quick turnovers which they turned into goals. A lot of passes were made, and the beaters did a great job disrupting their opponents’ play. 23rd April is World Book day, aimed at celebrating the power of books and the enjoyment of reading, and this year it marked the start of our celebration of International Book Week. The school was invited to dress up as their favourite characters. In assembly Aashiqah Regal (Head of the Library) talked a little about the power of books, and invited some of our Public Speakers to read excerpts from books they have loved. Lauren Poole, Kristina Burge, Alex Nicholson Middle Row: Amarachi Vazidlule, Jasmine Kennedy, Bhavika Kalan, Joanna Roodt, Ciara Birch, Aqilah Regal Front Row: Ashleigh Cozett, Kendra Petersen, Rachelle Issa (Head), Ms Allison Eakin, Aniqah Brenner, Selena Pereira, Zoey van Reenen 2018 was a busy and eventful year for the Peer Guides. Starting off, the Peer Guides met with the Gr 8s during orientation. We connected with them and discussed any fears of coming into high school. Throughout the first 2 terms we facilitated the ‘Big sister, Little sister’ programme where we connected with and mentored chosen learners from WGJS. Bonds were made and it became a time of growth and learning for all. One initiative we launched at WGHS was the ‘100 Acts of Kindness’ campaign. This was a way to spread love and cultivate kindness both within and outside the school. During the third term we launched a workshop in collaboration with FemSoc titled ‘Body Talk’. 2018 truly was a year in which the Peer Guides began to blossom. WOOL FOR WONDERS The Wynberg Old Girlsâ&#x20AC;&#x2122; Union, together with the junior and high schools, ran their eighth Wool for Wonders campaign this year. This campaign is truly a project that involves our whole community, with the girls, family members and friends contributing by donating wool, knitting items or sewing together blankets. We also held a special assembly to celebrate the culmination of the campaign, where we were joined by both participants and some of the beneficiaries of it. In this very special assembly, Bud Higgins from Tinmugs Africa Trust received some of the garments provided by the schools and the broader community on behalf of the organisation. It is through Tinmugs Africa Trust that the blankets and garments were distributed. This is why we knit! Our athletes achieved success early in the season, breaking an incredible nine records at the very first Super A Section Interschools’ competition. To top it off, Wynberg also won the medley relay on the day. This led to 23 qualifying to take part in the Southern Zone Championships. There were stellar performances by many of our athletes, including first places for Olivia Behrens (high jump), Amy Jonathan (300m), Imrah Mia (200m), Courtney Joshua (shot put), Beth Goode (1500m and 3000m), Ruby Behrens (long jump and triple jump), Lara Johnson (100m and 200m), Jordan Louis (long jump) and Jessica Petersen (triple jump and 400m). They were among the 17 WGHS athletes who were selected to participate in the WP Athletics Champs. Following their performances at the Western Province Champs, Ruby Behrens, Olivia Behrens, Lara Johnson, Gina Walker and Jessica Petersen were selected for the WP Athletics team, and participated in the Western Cape Champs in Paarl. Indisputably, the highlight of the weekend was Olivia Behrens’ - a Grade 8 learner - becoming number one in Western Cape in the High Jump event with a jump of 1.61m. In achieving this, she also beat her personal best. Lara Johnson, the best sprinter our school has had for a very long time, won a bronze medal in the 100m and 200m races. Olivia went on to represent the Province at the National Competition in Potchefstroom in March. Lara was also chosen by Western Province Clubs and opted to participate in the Club National competition which took place in Paarl in April. Cross Country Several Cross Country League races took place, including one at Rondebosch Boysâ&#x20AC;&#x2122; High, a particularly challenging, sandy and hilly race along the canal at Pinelands High, and the SACS race where participants were even running up and down some sets of stairs. Beth Goode and Karen Roodman both placed in the top 10 at the SACS race. The PGSGU Interschools Cross Country event took place at Rustenburg at the end of the season. SQUASH The Squash girls placed second in the Interschools Squash Tournament at the WPCC. Inge Tripod and Pearl Gungu were selected to represent Western Province at the Interprovincial Tournament (IPT) during the June Holidays. the emotional farewell to our very own Ms Janice Hudson-Windsor. The fantastic number of provincial players we produced this year stands testament to the high standards of hockey coached and played at Wynberg Girlsâ&#x20AC;&#x2122; High. At the inter-provincial tournament the WP U18a team (with Aaminah Domingo as player and Ryan Pillay as assistant coach) won the gold medal! Special mention must be made of 3 players who were selected for National Hockey sides: Grace Cochrane and Kelly Johnson were selected for the South African U16 High Performance Squad, and Aaminah Domingo was selected for the South African U18 High Performance Squad. Our Indoor Hockey teams had another enjoyable and competitive season. This year we also took part in a pre-season tournament held at the Bellville Velodrome. Nihaad Sulaiman, Grace Cochrane, Kayleigh Rogerson and Keightley Walsh were selected for Pro Series Indoor Hockey Teams, participating in the National Tournament in Cape Town in December. NETBALL There were many highlights in the 2018 Netball season, including participation in the u16A Netball Champions Cup (where we won the Plate Final), matches against touring teams from, amongst others, Dubai, and the PGSGU tournament. Our teams participated in the CTSNF (Cape Town Schoolsâ&#x20AC;&#x2122; Netball Finals), where they faced the other winners from all around the city. Four of our netball teams remained at the top of their section within the 1st League Southern Zone. These teams are our U14B, U14C, U16B and U16C teams. Special mention must be made of Jade Hartnick (U16) and Jessica Petersen (U17) who were selected to compete in the Inter-District Tournament in Wellington. To mark the end of the Netball season and to celebrate the achievements of the players, the annual Netball Dinner was held in the Aileen Currie Hall. It was also an occasion in which the matric players, the coaches and managers were thanked for their support, encouragement, commitment and leadership. PGSGU Netball is a blast for the U19As! In an effort to conserve water owing to the drought, there was very little swimming done in 2018. SYNCHRONISED SWIMMING There were outstanding achievements from our Synchronised Swimmers in 2018. Ten girls were selected to participate in the Grade 1 Synchronised Swimming Assessment Day in February, working exceptionally hard to master the skills required. Sarah and Casey Williams took part in the SSA Level 3 Synchronised Swimming Competition in Port Elizabeth in April. Apart from being part of the winning synchronised swimming team for the sixth consecutive year, these two girls were also selected for national squads. The teams will be competing at the FINA World Championships in Korea in July 2019, and the FINA Youth Championships which take place in Slovakia in September 2019. TENNIS The Wynberg Girlsâ&#x20AC;&#x2122; First Team enjoyed a mixed season in 2018 winning 6 and losing 3 matches in the 2nd league. The girls played in a positive manner and were committed in all their matches. The 1st team consisted of Kian Green, Erin Harris (c), Inge Tripod, Megan Farquhar and Jessi Springorum. The second tennis team had a strong season and dominated their league. Regular team members were: Kayleigh Henderson, Na-eela Coleman, Jenna Grey, Zaakirah Khan and Ashleigh Moyce. Johannesburg to compete in the St Peter’s tournament. Limits were pushed, boundaries were broken and memories were made. The girls fought through the exhausting 3 days and managed to exceed their goals by winning the plate final! This was the first time in many years that the girls came home with some silverware. The last challenge for our U16A and U19A teams this year was the Waller Cup where our girls reached the semi-finals. All in all, and notwithstanding the curtailed fixtures owing to the water crisis, it was an exciting year of waterpolo. Wynberg Girlsâ&#x20AC;&#x2122; High is proud to recognise and honour the sports achievements of our coaches, staff and learners, all of whom have excelled in their various sporting codes and been selected to represent their province and, some, their country. Communications 2018 Wynberg’s communication over the last year has developed into a vibrant and exciting medium for young girls to showcase their photographic and videography skills. This year we introduced the communications “team” who marketed the school in various ways across our social media platforms. These girls were selected on the basis of their skills and talent and I have honestly been blown away by their professionalism and creativity. On our Instagram we started our “Humans of Wynberg” campaign which highlighted the great things at our school across the various pillars. Our podcasts have also taken a new direction in the form of video podcasts whereby the parties involved have an onscreen discussion which could also include visuals and promotional content for upcoming events. Other videos that have been produced ranged from various outings to “behind the scenes” footage from our matric ball. In February we also produced a video for Valentine’s Day which featured many of our teachers lip syncing along to Dua Lipa’s New Rules. I have been extremely impressed by the talent of our school and I know that the communications team will continue to do amazing things in the years to come. time: our first edition said farewell to the matrics of 2017 as well as to a few of our teachers; the second dealt with the different types of love and what love truly is; our third edition was about the beautiful world in which we live and aspects of the world about which we don’t typically talk. We also created a new creative sub-committee who helped make the Wynpress more aesthetically pleasing by using more pictures taken by the photography society or just pictures sent along with the articles. This has definitely led to more people being interested in reading the Wynpress and one can see the improvement from our first to our third edition. GRADE 11 The Grade 11s had quite a fun-filled year with various outings and a three day camp. Before going to Rocklands, they participated enthusiastically in a drumming session. This set the spirit for the rest of the camp. At Rocklands, they took part in a number of sessions such as Conflict Management and finding out what type of personality they are. Their leadership skills were tested on the obstacle course and the dance floor where they had to work together to achieve their goals. There was a lot of free time for bonding and getting to know each other. During the year, they went on outings such as the Geography outing to the Koeberg nuclear power station and the Life Sciences excursion to the Department of Anatomy of the University of Stellenbosch. The Learner Leadership activities were completed without too much stress. By doing these activities they learn about teamwork and meeting deadlines. GRADE 10 2018 was a busy year for Grade 10. Starting off the year with a bang, the Grade 10s settled into their subject choices. During the camp days in March, they participated in an Amazing Race on the first day - running through the school, following clues and learning about the history of the school. On the second day, they participated in sustainability and green matters run by Plant the Seed and on the third day, the Grade 10s devoted their energies to doing good for Mandela Day by making puzzles, sleeping bags for the homeless and cards for an old age home. In June, after working hard for their exams, the Grade 10s relaxed and enjoyed a grade bonding session with a Pizza and Movie night. Term 3 saw them starting their Learner Leadership projects in preparation for leadership applications in Grade 11. Overall it has been a fun-filled and successful year. PLANT THE SEED The Plant the Seed programme was initiated by the Life Sciences department, in place of their Kirstenbosch excursion. They collaborated with the Geography department for a cross-curricular venture. However, as knowledge of and caring for the environment is such a universally important topic, it was felt that ALL the Grade 10s would benefit from this programme. Therefore, Ms Stephanie Pienaar as head of Grade 10 also came on board and the programme was run during the â&#x20AC;&#x2DC;summer schoolâ&#x20AC;&#x2122; period when the Grade 9s and 11s were at camp. The Grade 9s had an adventure-filled year. Their Back2Basics camp tested limits, built resilience and helped the girls discover the strength inherent in good teamwork. It was a time to get to know your peers through a range of activities, from crawling through stagnant, muddy water to singing and dancing in the evenings. In their DMT classes, the Grade 9s used Adobe Spark to introduce a friend to the class. Some unknown talents were discovered and celebrated in this process. Through these introductions they discovered dancers, models, photographers, selfie queens and chefs amongst the amazingly talented Grade 9s. Another Grade 9 projects at Wynberg is a community service project, in which the girls were inventive and worked tirelessly to help others. One example of this was 9Bâ&#x20AC;&#x2122;s efforts to support the St Michaelâ&#x20AC;&#x2122;s Home for Girls. The home provides emotional support to enable young women to deal with the devastating effects of abuse. The Grade 9s also had the privilege to go on academic outings to Intaka Island and District Six, bringing the syllabus to life. Good luck to all the Grade 9s as they embark on the FET phase of their education. GRADE 8 January 2018 saw Wynberg Girls’ High School welcome our new intake of Grade 8s. As the first Grade 8 cohort to start their WGHS journey with the new school values Inclusivity, Integrity, Courage, Accountability, Respect and Empathy – we trust that these young girls will develop a new community of inspiring, fearless and committed ladies working in our communities and even globally. The Grade 8s of 2018 have proven to be a fearless group, ready to take on any challenges that come their way. May their continued journey prove them to be proud warrior women of Wynberg. Welcome to Wynberg Girls’ High, class of 2022! helping with homework and going the extra mile to make our stay even more enjoyable! My term in office was testing but yet full of growth. I am so grateful to the team that was working alongside me. I truly appreciate the faith and the trust that they had in me, it allowed me to lead them the best way I could. That is what contributed to making 2018 such an amazing year. Thank you to everyone and especially to my fellow hostel matriculants for making this year as wonderful as it has been. Waterloo Hostel - Matric Farewell Dinner The theme for the annual Waterloo Hostel Farewell Dinner was ‘Hollywood’. The Grade 11s hosted a fabulous evening where the matrics and their ‘dates’ (a member of staff invited by each matriculant) were treated like stars. 2018 leadership term, conquering our goal of finishing in the top 3. The house also won the interhouse academics trophy thanks to the contributions of the girls in personal and group endeavors. For the leaders, it was inspiring to see the love and passion that was brought out of the Cavanagh girls this year and we are certain they will continue to exhibit these qualities in other areas in their current and future lives. It was an honour to lead such an amazing group of young women in 2018 and I am confident they will continue to make themselves and Wynberg proud. Copenhagen had a very exciting 2018! Although in some ways we had a slow start, we eventually achieved our primary goal of moving our house flag to the other side of the school hall by placing in the top four houses for a term. It was a colourful year, filled with plenty of fun house challenges where we placed well. Another highlight was our annual singing competition, where our hard work at harmonising paid off for us! It was a year defined by growth and development as a group. We worked hard and had fun - Copenhagen has such potential, and I know that the house will continue achieving their goals. The Kirsten Pandas had a super year in 2018. We played, danced, acted and participated in everything with great enthusiasm and spirit. From the Grade 8 Orientation and Pool Party to tutor group bonding, sandwich-making, Wool for Wonders knitting, our Maynardville Park clean-up and all the challenges, we had fun, supporting each other and making as much noise as possible. Our Disney Knowledge Interhouse Quiz was a roaring success, with teams squealing with excitement. We grew closer and made some special memories together. Go, Kirsten!! biscuits for a childrenâ&#x20AC;&#x2122;s home, collecting dog and cat food for a shelter, attending beach clean-ups and making decorated biscuits for the support staff. Our Silverleans showed their generous and good-spirited nature by completing many hours of individual community service and random acts of kindness throughout the year. This year has been jam-packed with fun opportunities and events where Silverlea has supported one another as a family and truly proved to be royal and purpleblooded and a house which stands as a formidable force ready to conquer any challenge gracefully, following in the footsteps of our mascot, the trusty heffalump! Grey, Laila Manie and Sarah Williams was incredible. Our House Co-ordinator, Mr Andrew Hunter, always encouraged and motivated us to achieve the vision we set ourselves when our year began and we thank him for guiding us this year. “Winning isn’t everything but the taste of victory is sweet”. successes and even though we had many farewells, they all helped play a small part in inspiring the Wellesley girls to enjoy this year as a whole. Amazingly we had many individual achievements that Wellesley acknowledges and is extremely proud of, as it showed each person’s skills that helped build Wellesley this year. Describing this year as a rollercoaster includes the fact that we had good and bad experiences as a house. But we never allowed the bad to affect the good, which helped us to achieve what we did this year. Our achievements such as winning our own house challenge, our vocal ensemble placing second for the Singing challenge, donating bread every Thursday without fail and even winning the House Plays, are evidence to how Wellesley grew as a house with pride and unity. Days filled with laughter, exceptional girls and memorable experiences made 2018 the year for Wellesley to shine, living up to our house’s honour of wearing yellow as gold. INTERHOUSE CHALLENGES The house challenges once again provided opportunities for the girls to build house spirit, enjoy themselves, provide entertainment, and showcase their talents. Two fun-filled sports days were held once each for summer and winter sports. The house play challenge provided expanded dramatic opportunities to our students. The singing challenge was the jubilant and entertaining affair we have come to expect. The themes for this year were “Musicals” and “Making a Change”. The Achievers’ Dinner is an event that is held to celebrate the achievements of our senior students in the four pillars of Wynberg Girls’ High School. This year the event was held at Moyo, Kirstenbosch. Our guest speaker was a former Head of the RCL, Yeukai Chamba, and she spoke of the importance of standing up for your beliefs and following your dreams - even if it means making sacrifices to do so. Afterwards, the announcement of the 125th Past Pupils’ Pillar Awards took place. Congratulations to the winners of these prestigious trophies for 2018: Na-eela Coleman (Academics), Bella Draper (Culture), Kendra Petersen (Service) and Aaminah Domingo (Sport). Wynberg Girls’ High opened its doors to prospective learners and parents at our two Open Days, with a wonderful display of Wynberg Pride.